Personality- She isn't sure where her loyalties should lie, even after her father's death. Could the Capitol be right about keeping the districts in line? Or is it wrong? Kiara doesn't know. She is clever and thinks things over before doing them. So she's sensible. But she is always sometimes a little too good. She will trust people she shouldn't getting her into sticky situations. So she's too certain that people will be good to her. She's almost blinded by the Capitol's idea of life. Fears- Somebody she loves getting drawn for the reaping. Anything bad happening to somebody she loves. Wishes/Ambitions- She wants to do the right thing more than anything else. She does everything she can to stay out of trouble. Favorites- Color: Yellow, because when she see's it, the sun is shining or she is looking at a pretty flower. 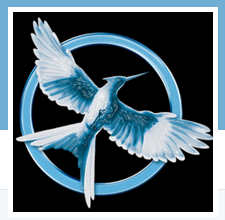 Animal: Mockingjay, because they mean the end of a long day of work. Food: Anything besides un-seasoned brussel sprouts, which is what she's served every night. Hair (Texture, length, and color)- Super curly and dark brown, almost black. Kind of sticks up and bounces but is 5 in. past her shoulders, so it isn't as bouncy as Rue's. I find it very interesting that she in not afraid of being drawn for the reaping herself. At first I though, this character is way too noble and unrealistic, but then i read about her personality more and know think she's actually one of the most complex characters I've seen somebody some up with from scratch. Of course, maybe you've been perfecting that character for a while, but I love Kiara! This is ACCEPTED!